In your studio and in your classes, growth and development are key. What is your vision on dance and development? If I look at the development of people, it’s funny to see that people who are a member of our studio for months or even years always make progress. But then sometimes it happens that they stop for a month and when they come back, something changed. Sometimes when you solve some personal issues in your life, your dancing will also improve. But I think the knife cuts both ways: dancing really helps people to come closer to themselves and to be able to face certain issues or certain traumas. And the beauty of it is that we don’t necessarily have to speak about it. It is by changing the way you move, you open your character for further development. It’s almost as if you prepare the body for the mind to make a leap of faith into your next self. I think it’s beautiful that we as teachers can add to this process. Sometimes the development happens in a day, sometimes it happens over years, but I see personal growth in all of our students here. I think it’s also very clear for themselves, even if they don’t put it in words. We have students in our studio that are with us for already 10 years and dancing has become a necessity for them. It’s like they intuitively know it’s good for them and they keep doing it, they keep growing and becoming happier and more balanced persons. Do you think anyone can dance ? Yes, anyone can dance! Recently I read a book about amusia, but it’s very rare and only 0.4% of the population can’t hear measure, melody or tone. Personally I have not experienced this with any student in my lessons. Although a significant part of the people that come here at first believe that they are very amusical or amotoric, think they will not be able to learn to dance and say “good luck, i hope you take this challenge!!” . That always makes me smile, because it’s much more that they block themselves with a certain kind of shame. And that shame is not so much in dancing but about other things in their life and is manifested in dancing. As a teacher, I don’t have to address these other things in their life. I just have to make them love their body again, make them love using their bodies and make them love being close to other people. That’s all it takes and when this develops, that other part in their life develops with it. It can be really fulfilling when people come in and they really can’t dance and after a few years they don’t even remember having a life before dancing. So then you can also say: everybody should dance!? Absolutely. One of my goals – and that is really about a culture shift- is to incorporate dance classes in primary school, secondary school and every layer of education and society. As a society we already incorporated sports, which I think is a good first step. Sports, as dance, works on the connection with your body. But dance adds to that because it also makes a connection with mental activity, for you normally dance to music. Usually, you dance more for enjoyment then for competition. Sports, generally speaking, puts more focus on competition, what makes it a one-sided activity. I believe that dance can be more open for all people, because it’s not about winning. It’s just about enjoying your body to music and that will make you a more successful person. It will make you healthier and in the case of social dance, it also increases your social skills significantly. If you look at schools, where still bullying is a big problem, I wouldn’t say that sports solves it. I would say sports aggravates that problem where dancing would probably be one of the best antidotes. If we already have this effect on development with people that come here in their forities or fifties and we can still make a significant change in their life, imagine what we could do on national or international level with all kids starting to dance at four years old. What an enormous impact this would have on the world! This is idealistically a world without war, because the majority of children can have the best tool there is to cope with their traumas, their losses and their hardships where they go through in life. If we teach them this is a very early age, this is a tool that they can use the rest of their life for anything they encounter. Did you dance as a child? My mom is a music teacher and we had to play an instrument as well as do group sports. My parents didn’t consider dancing at all. Not that they were against it, but it was just not in the family. Music was in the family, although I didn’t have real talent to make music and enjoy it as much as my siblings did. I played the hobo, where my brother played saxophone, my sister the piano and vocals and my little sister played the cello. We could make an orchestra together, but we never do. I do think I would have grown up differently if I had dance in my life. Two of my collegeas and good friends told me what dance meant to them growing up: because both of their fathers died when they were in their teens. dance was the thing that made them deal with this and heal their traumas -as far as this loss can be healed-. They became successful in dance and I think that they also have something to offer to their students in that sense. This brings us to your ideas about the position of dance in our culture.. Yes and that´s something we need to change. Dance is a way to learn, to develop and to express and should have an important role in society. I am not saying that for example Latin culture, where dancing is part of the culture is therefore ideal, but it uses dance to express. If you look at African culture it is most clear; they use dance individually as well as in their community to express and to share emotions. That means that when you are angry or sad, you can at least express these feelings and share them with the group so it releases pressure from your life. I think it can have effect and play a role in every aspect of our lives. If you look at humans are group animals. Studies are showing us that our intelligence, our IQ doesn’t influence our succes in life that much, but emotional equotion, EQ, does so enormously. So the people who are emotionally intelligent are more fit for success. I think dancing is the best way to make people more emotionally intelligent and therefore can have great effect on individual lives and society as a whole. How do you think we can make this culture shift? It will take conviction and a lot of patience, because if we want to create a culture shift, we have to start with our children. We need to create a society in which the children that grow up in it don’t know otherwise. But what we can as an individual is to change our perspective of success. So when we look at success now, it’s if you wear an expensive suit, if you have a phone or car and then a bit further down the line is how much money do you make and what kind of job you have. It’s still very much tuned to whether you have power or not. Because if you’re working at the bank or in politics you’re close to the money stream. That makes you more powerful and those professions, although I believe not more valuable for society, are still valued higher than jobs that don’t involve powerful positions. In an ideal society the reward would be determined by your skill times your responsibility. In our society this is not the case. There are highly values positions in our society where you don’t carry a lot of responsibility, you don’t have to have a lot of skills but you are close to the money stream. And money is considered ‘the new God’. So then you become automatically successful and powerful just by being in these specific positions, not having to do anything exceptional. But as a society we can actively choose what we value. Bhutan is a funny country in a sense that they don’t have a gross national product, but a gross national happiness. This means they don’t measure their economy by how much money is made. I think it ‘s a very refreshing look at things that a whole country focuses on a whole different set of values. I’m not saying that we should stop being capitalist and start being Buddhist or communist. The capitalist system has a lot of benefits and we should use those benefits to improve our lives. One of the things we could do on a political level is to subsidise wisely. I am aware subsidising has become a dirty word in the last 20 years, but it enables you to stear what we value as a society. If you look at where the subsidies now go, I don’t feel that society as a whole benefits that much from it. If you look at what we all do value highly is finding a mate and having social life. For example when you take into consideration how much time people spend on social media and how many dating apps are available, like Tinder. I believe these apps are a shortcut to connection but are not really fulfilling, because it doesn’t really change your life. Also the people you digitally meet, usually don’t really change your life. The apps are catering to social needs without delivering on them. That’s what all these social media do, because it doesn’t have any content itself. 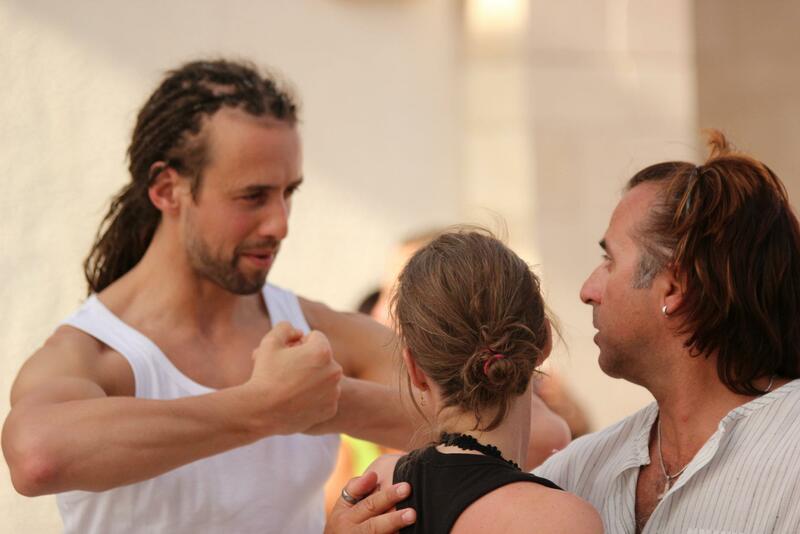 But by teaching people skills of themselves, for example through dancing, this can significantly change their life. There is a big need for connection and that’s the success of all the social media, it shows that there is something lacking in society. A community life, that used to be catered by the church which is now disappearing. What the church did was what we now as a dance school should do: bringing people together and giving them the tools to socially fulfill their own lives. So this is how you feel we can help to make a first step? Yes, make people aware that they can be an activist. They can be an ambassador. It sometimes feels opportunistic or commercial that we try to activate our students to do promotion for us, but I think it’s an important part in the chain of changing the way people look at dance. Because if they are really enthousiastic, they will activate their social lives and that’s like an oil spill spreading.